Chatbots are intelligent conversational systems that allow users to talk and interact with artificial intelligence (AI) in a simple way. Chatbots usually try to simulate human behavior to make the conversation as enjoyable and natural as possible. Most chatbots require the input of text through a keyboard. Increasingly, however, chatbots are able to understand spoken language. And as digital assistants they can carry out simple tasks. Well-known voice-based digital assistants include Siri from Apple and Alexa from Amazon. Recently, voice-based digital assistants have also been introduced in the car, such as in the A-Class from Mercedes-Benz. Social bots are a subform of chatbots. They are used in social media, e.g. in forums, on Twitter or Facebook. The first chatbot called ELIZA was developed in 1966 by the German-American computer scientist Joseph Weizenbaum at the Massachusetts Institute of Technology (MIT). ELIZA simulated a therapeutic conversation with relatively simple algorithms. Weizenbaum had opted for such a conversation, because it can be conducted without a huge knowledge base: The chatbot usually asked simple questions, for which he took up keywords of the client. A successful example of a learning chatbot has recently been developed by Professor Ashok Goel at the Georgia Institute of Technology. The bot, named Jill Watson, looks after Ashok Goel’s computer science students in online forums, relieving the tutors. It has been trained by Goel on more than 40,000 questions. However, the real breakthrough came when Jill Watson also got the skill to analyze the context of a question. With this new ability, the bot managed to answer 97% of the questions in the online forum correctly. Many students did not realize that they were talking to an artificial intelligence. Some students even tried to negotiate a date with Jill. 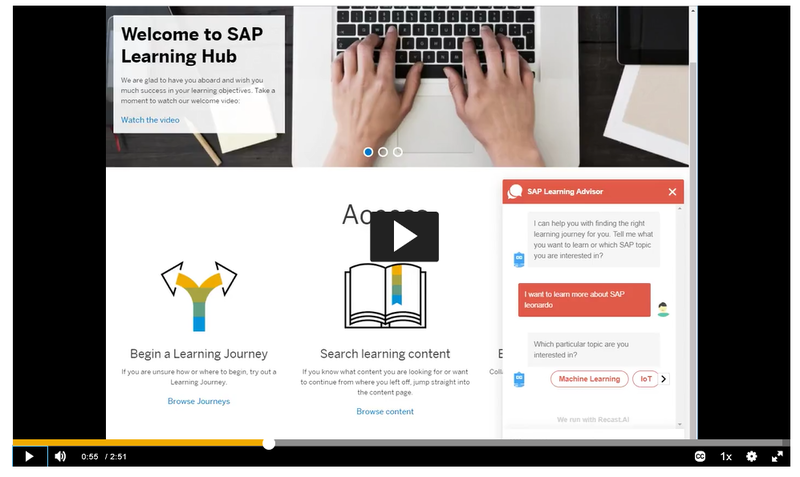 At SAP, we implemented two learning scenarios where we are using chatbots. For the first scenario “Give advises and personalized recommendations”, we built a chatbot with Recast.AI and integrated it on our web pages. The chatbot helps learners to find the right learning journey for them (Video 1). 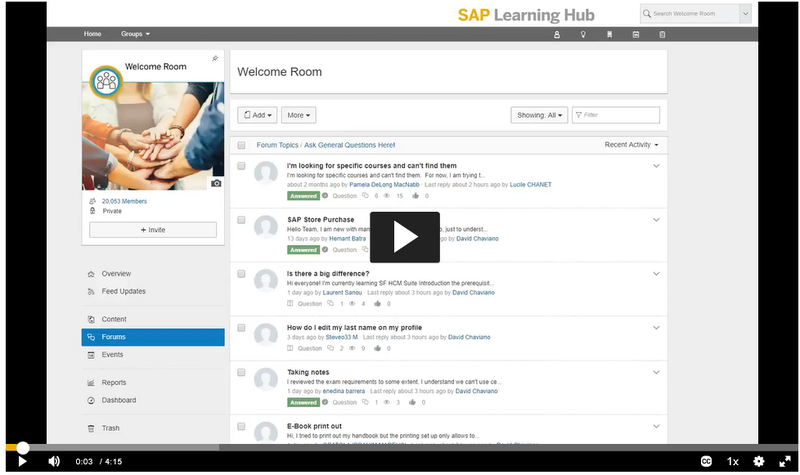 For the second scenario “Answer learner questions” we trained a bot on Recast.AI to answer frequently asked questions in our learning communities on SAP Learning Hub (Video 2). The bot was than integrated in SAP Jam, where he is now monitoring all forums and supporting our moderators by answering questions. A master thesis shows, that the bot can answer about 40% of all user questions with a high acceptance rate. Chatbots can play an important role in learning. They can give personalized learning advises, answer typical learner questions, and even coach learners. It was relatively simple to build these bots with Recast.AI as the platform not only features a graphical user interface for modeling conversations and setting up bot skills, but also offers debugging functionalities, and advanced analytics for identifying unmatched questions. Was the forum example from an actual live website or was it just an experiment?